I have been an admirer of today's artisan for quite some time. In fact, they were one of the very first shops that caught my eye on Etsy, because the work on the piece I saw was so breathtaking and so intricate that I couldn't imagine how much time and effort went into it. That piece is the monarch butterfly pictured here. 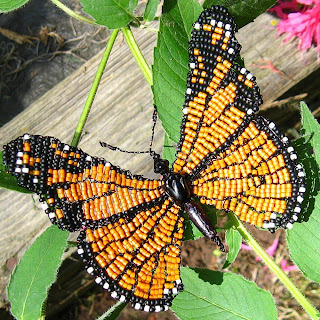 Made out of tiny seed beads, the Monarch measures four-inches wide by three-inches tall and it states in the item description that it only took 30 hours to make! I say "only" because I imagine that should I have tried something so beautifully intricate you could double or maybe even triple that amount of time. It's obvious I'm not the only one who loves this piece, too. 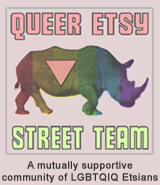 190 people have made it one of their favorites on Etsy! Natures Treasures by Patereeves is where you can find this beautiful butterfly, and it's not the only one offered there! There's a few butterflies, dragonflies, turtles and more scattered among watercolor prints, vintage finds and other intricately beaded pieces of jewelry and accessories. I loved the browse through this shop and, even more, I loved the browse through her previously sold items where you can find even more beautiful, intricate pieces showcased for all to see. TO VISIT NATURES TREASURES BY PATEREEVES ON ETSY, YOU CAN CLICK THE PICTURE ABOVE OR, IF YOU'D RATHER, CLICK RIGHT HERE! How on earth does she do that? It's just lovely.